The basic shape of a 20''' Matador chimney has not changed in well over a century. The lamps burn okay but their full potential is not even approached. This new chimney make a common 20''' Matador lamp into a ''White Light'' lamp with brilliant, white reading light. Gone is the pale yellow flame produced by a chimney of standard shape. Remember that light IS heat, so these chimneys do burn hotter than a regular bulge Matador chimney to attain the ''White Light." My chimneys work best on metal font 20''' Matador lamps made prior to WW I, and care must be taken with DHR burners on glass fonts because the DHR flame spreader sits lower than all other 20''' Matador lamps and the burner design is not as refined as lamps from German, Belgium and UK manufacturers. I designed this chimney using the Vulcan principle patented by Emil Wild on August 19, 1884. The flame is absolutely stable even at a full curl. 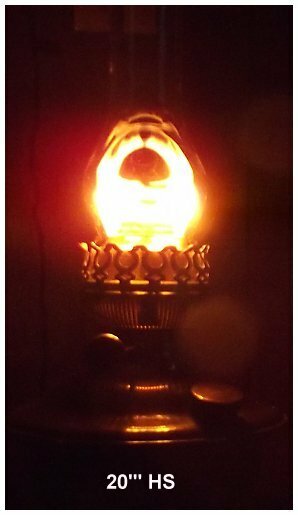 The lamp can burn for hours with nary a flicker in the flame. This is achieved by molding the shape of the flame and draft around the wick to achieve maximum combustion - and the result is not just a stable, beautiful white light but also a very clean burn with no aroma even when burning common kerosene. The tulip shape of the chimney bulb releases the heat at exactly the correct rate to control the flame and the chimney remains clean through repeated burning. Click photo at right to enlarge it. 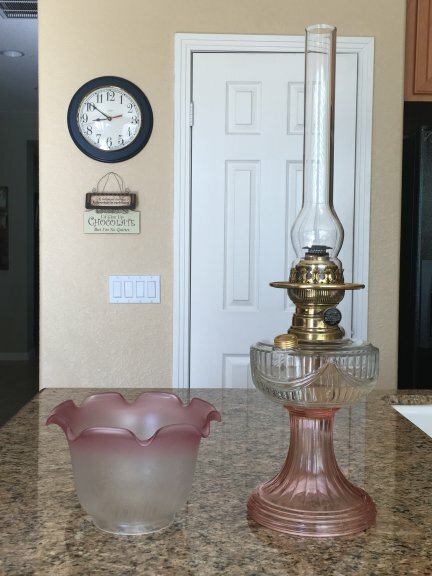 See the flame in 5 different lamps, below. 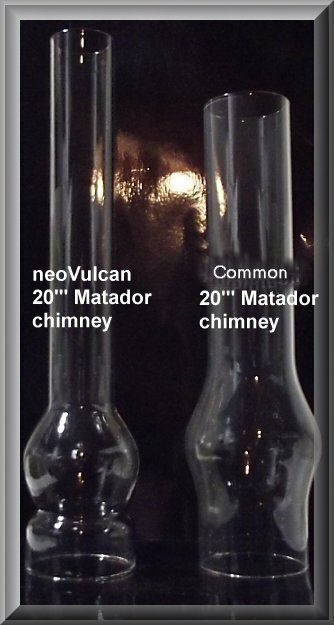 New neoVulcan chimney compared to common 20''' replacement chimney. * Alex Marrack provided the photograph above and noted that the only ''true'' 20''' Matador chimney was the one on the left above. Note the distance from the base to the bulge is much shorter than the chimneys on the right. 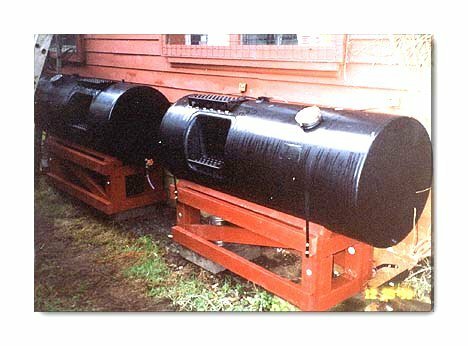 20''' Matador chimneys commonly available since WW II were actually copies of the Veritas or Belge chimneys, NOT the wide bulge E&G chimney. The original E&G chimneys with a 91mm bulge burned very well with a wide flame front but are very scarce. My neoVulcan chimney achieves ''white light'' status by controlling the flame into a tight, intense ball. 20''' W&W Agni burning at 1/2 curl. 20''' DHR Matador burning at full curl. 20''' Hugo Schneider Matador at full curl. 20''' L&B Matador at full curl. 20''' SI Gladiator at full curl. 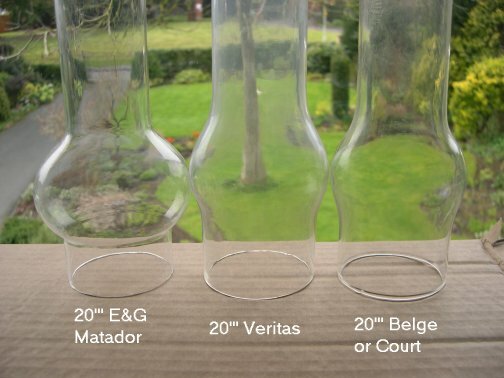 * A true ''extreme bulge'' E&G Matador chimney has a 91mm bulge but are very rare. 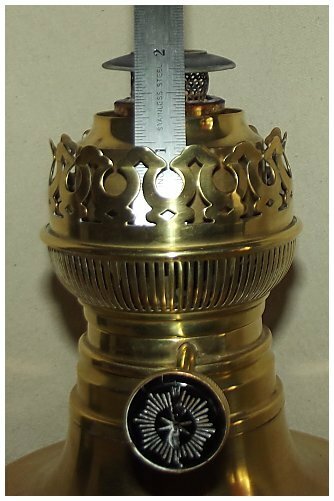 It is impossible to have measured all of the 20''' Matador lamps made in the past 120 years, but all of the ones I have measured indicate the flame spreader disk is about 1 3/4'' above the base of the chimney seat, as shown at left. I designed this chimney to fit a minimum disk height of 1.562" (20''' Agni) and maximum disk width of 1.504" (L&B). The dimensions of other 20''' Matador flame spreaders is listed below. Flame spreaders of these dimensions will fit through the pinch and be high enough in the chimney bulb to produce a beautiful, controlled curled flame. Agni showing flame spreader height above chimney pinch. The flame spreader should be 1 3/4'' (44.45mm) above the chimney seat. 20''' Matador lamps have large wick gaps as they were designed to utilize thick, relatively soft wicks and burn better with a thick, soft wick. Common Kosmos wicks are a hard weave and thin to facilitate easier installation. A thin wick will leave a gap beside the wick through which fuel vapor can escape and disrupt the steadiness of the flame. There are no factory-made thick 20''' wicks, but I can make them using quality wick material made for use in 20''' center draft lamps. NOTE: These thick wicks are only required by those who want to burn their lamp at full throttle, which is not necessary. 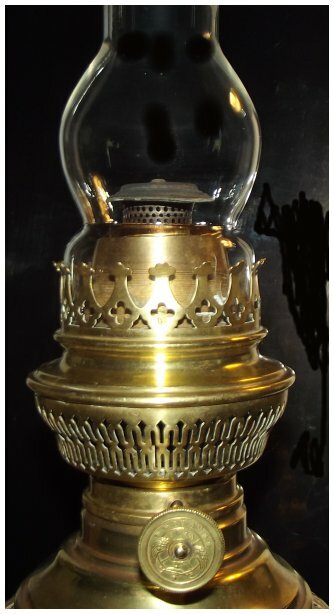 The 3 5/8'' x 8", 0.92'' thick wick will burn just fine and the lamp will be beautiful indeed wearing this beautiful chimney. 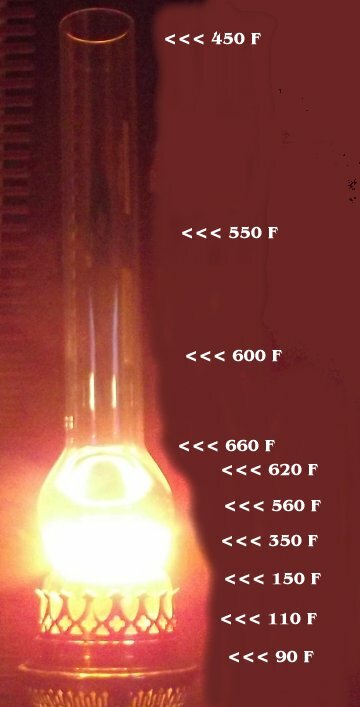 The thinner 0.076" thick wick is not recommended for these lamps when using the neoVulcan chimney. 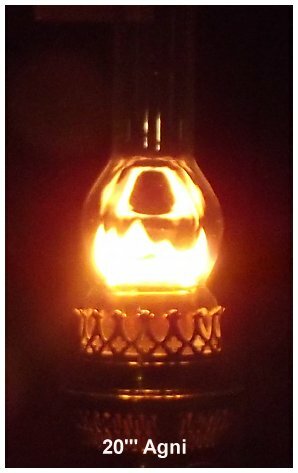 3 5/8'' (92mm) wide, 0.108" thick for 20''' DHR & L&B Matador lamps and many other 20''' Matador lamps using my new neoVulcan chimney. 3 5/8'' (94mm) wide, 0.108" thick for W&W 20''' Agni lamp using my new neoVulcan chimney. As shown above, the W&W 20''' Agni has the widest wick gap and requires the thickest - and widest - wick. The other 20''' Matador lamps use a slightly thinner wick but one that is still thicker than a common 0.076" thick Kosmos wick. 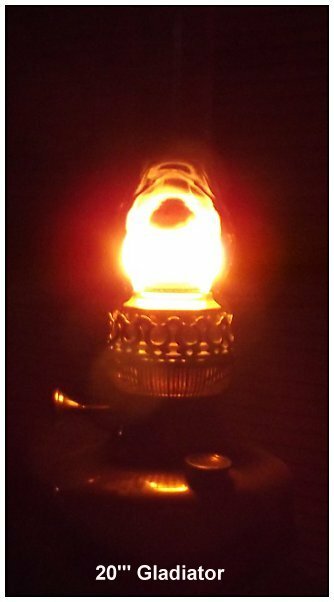 Many of the 20''' Matador lamps are well over a century old and the gearing mechanism can be worn, resulting in the wick rising unevenly. 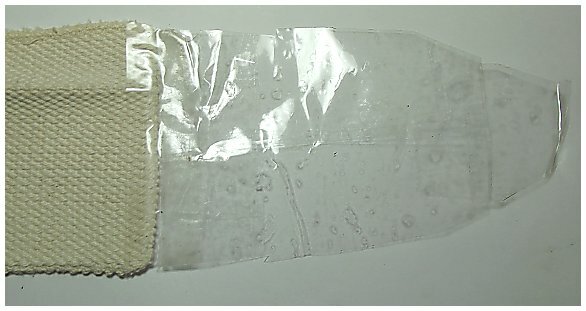 To correct that the top 1/2'' of the wick can be sewn together as shown below. I modified an Aladdin font to allow a 39.5mm threaded burner to be mounted on it. It's been an interesting experiment. Here are some pictures with a DHR burner with your NeoVulcan chimney mounted on an Aladdin font. I compared the light output to the Gaudard 20"'. The difference in light output is significant to say the least. Your NeoVulcan chimney on the DHR burner wins hands down. I placed an order for more wicks, a NeoVulcan chimney and another Sans Rival chimney. Your chimneys work great! I thought I'd update you on the hybrid Matador burner-Aladdin font testing per my earlier emails. All my testing uses your NeoVulcan chimney, which it truly excellent. It is possible to combine the Aladdin glass font (with the advantages of being able to see the kerosene level and having a separate filler cap) with a 20"' Matador style burner. This gets rid of the fussy and expensive Aladdin mantle burner, and replaces it with a more robust 20"' Matador burner. In addition, I've tested both the DHR and Hugo Schneider 20"' burners and both appear to work fine. 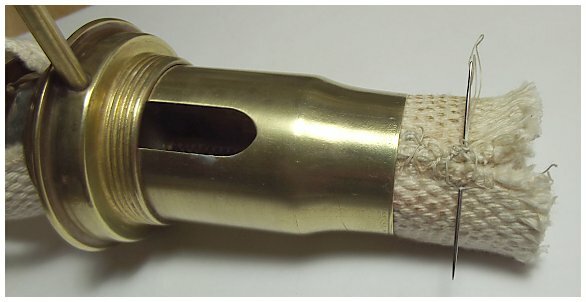 The heat build up in the threaded brass collar appears to be reasonable too. No more than the standard brass fonts. Next I thought I'd work on the aesthetics. I added a gas shade ring and Vianne shade to spruce it up a bit. I'm still working on it, but here is what I have so far. I hope you enjoy the update and pictures. I have used your new chimney while burning a DHR ideal Brenner with a 3 5/8 inch wick for quite some time now I can say it draws and burns hotter then with the old style Den Haan style glass the lamp with this setup lights up my entire living area so bright that you can read a book anywhere within a 15 foot radius of the lamp I use plain old kerosene in this and have had excellent results the font is a vintage Kastrup Holmegaard glass in cobalt blue we have came so far away from using fire as a illumination tool in modern society that the art of the oil lamp is long dead and gone. Jack T. from Florida also reported that his DHR burner with a NeoVulcan chimney burned hot, in his case too hot for comfort. As I noted above, the DHR has the lowest height from draft tube to flame spreader. No other 20''' Matador chimney customers using other burners have reported anything but great success. #1B, #1M, #1R, #2L, #2R, #2 P&A, #2B, #3L.